John, Mikayla and I enjoyed the rest of SCI and did not talk about the bear hunt until we arrived home. I finally directly asked John why he would ever want to buy a bear hunt for me. His response was 'Well you told me you could hunt something that could hunt you', so clearly something got lost in translation. I said, 'No, I said I could kill something that was actively attacking me.' John was humored by this and said, 'We can probably get the bear to actively attack you.' Clearly, he missed my point, failed to remember my fear of shooting guns, and forgot I am an ER nurse and prefer to save lives versus take lives. John's an avid hunter and he jokes on a regular basis how he doesn't want to take me hunting with him because he's afraid I will run out into the field and try and resuscitate whatever he shoots. March of 2017 I received the best news ever! The Alaskan outfitter had to push the bear hunt to Spring of 2018 because the bays where they bear hunt had not melted off due to a brutal, snowy winter. I felt like the weight of the world had been lifted off my shoulders, at least for another year. John was so disappointed by this news he immediately got online to try and find another Spring bear hunt. After some diligent research, John found an online auction at the Guide Outfitter Assoc. of B.C. annual convention held in Victoria B.C. 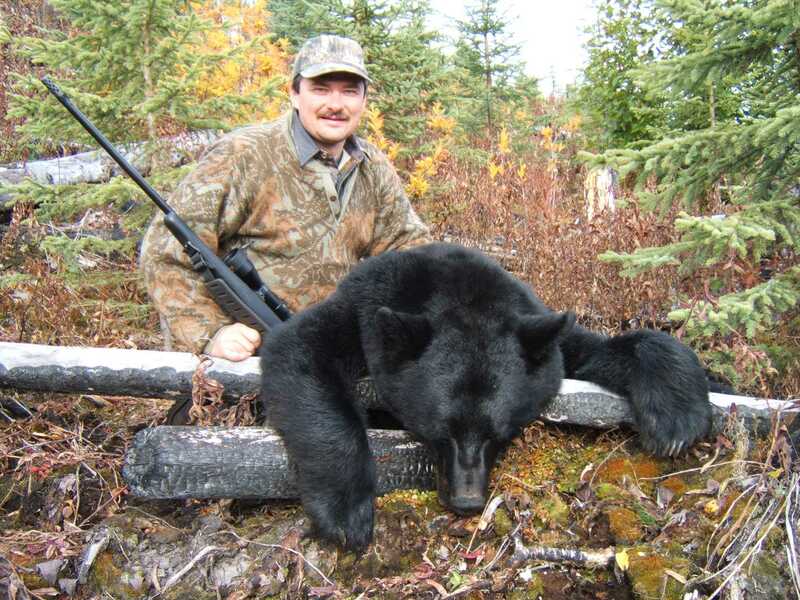 for a Spring black bear hunt...no fences, no bait. John was so excited to tell me the great news and when he did, once again, my heart hit the floor and I had a pit in my stomach. He was extremely determined to take me on a bear hunt so he put the wheels in motion right away. John drove me to his gunsmith, Rich Reiley, of High Tech Custom Rifles and had my arm length measured so I could have a rifle built just for me. John had relayed my fear of shooting to Rich and he recommended I spend some time shooting with one of his business associates, John Hermanson, who is retired military and an expert marksman. I followed his recommendation and finally worked up the nerve to shoot a .22. Once I figured out the gun wasn't going to hurt me, John coached me on shooting a variety of guns, at varying distances, all the way up to my .270. I was as prepared as I was ever going to be in a short timeline before our trip to B.C. The first day of our five-day hunt was on May 15th and I wasn't super excited to find a bear. Over the first few days I learned a great deal about hunting and our guide, Brad, was a wealth of knowledge. I started asking Brad about bear behavior, activity, what do they eat, when do they sleep and as we discussed this, he told me one very important thing. Brad said male bears will try and eat the cubs to bring the females back into heat for mating season and as soon as he said this, it sealed the deal for me. Any internal conflict I had over shooting a bear had suddenly vanished. As I processed through this, I thought I can save many animal lives, including bear cubs, by hunting a big male bear. May 18th was the first day I was truly ready to shoot a bear. I started the day with a whole new perspective and excitement to go find a big bear! Around 7:30pm Brad spotted the biggest 'Pooh-Bear' we have seen all week, grazing alongside the road. I was so excited I could barely contain myself. Brad and I hopped out of the truck and started down the ditch to stay out of sight. The wind was perfect as well and the bear could not smell us. Brad set me up for the shot at about 80 yards and 'Pooh-Bear' was quartering towards us so Brad told me where to place the shot and I pulled the trigger. The bear did a 180 and took off into the brush. Brad asked me how I felt after I shot, and I remember feeling stunned and told him it all felt so surreal. Brad started coaching me again and explained we must give the bear some time before we can start tracking him. By the time it was safe to go look for the bear, the night sky was setting in and we had to go back to the main house. We would get up in the morning and start tracking the bear. May 19th was the big morning! I was on no sleep and very anxious to go find 'Pooh-Bear'. We headed out to track the bear. The drive was only about fifteen minutes to where I shot it and it seemed like the longest fifteen minutes of my life. Mikayla and I had to stay in the truck as John and Brad took off into the brush with a gun to start tracking. They were only gone about twenty minutes when John came up and said they couldn't find the bear. Just when I went to place my head in my hands, John said, 'Just kidding, we found the bear and you shot him exactly where you were supposed to!'. I went from agony to ecstasy within seconds. We all headed to the bear. Brad and John showed Mikayla and I the scant blood trail so we could follow it to the bear. I was still in awe and for the second time since this all started, I felt the weight of the world lifted off my shoulders just in a much different way. It wasn't an easy journey for me conquering my fear of guns, practicing shooting, and never in a million years would I have thought I could ever pull a trigger. I am so thankful and so blessed for those who have helped me along the way. 'Pooh-Bear' was a big fluffy animal with a skill of 19 4/16" and his hide measured 6'6" tall. 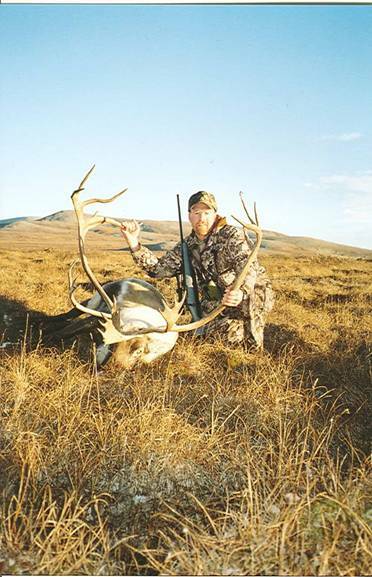 This was a bucket list type of experience and thanks to High Tech Custom Rifles, John Hermanson, and Cariboo Mountain Outfitters, the trip I once dreaded, ended up being a dream come true. I had one of your custom muzzle brakes put on my 270 due to it only being 7.5 lbs with scope and bipod, and jumping to much to be able to spot my shots at long distances. I was amazed at how well the brake works. My rifle no longer jumps making it easy to spot bullet plash. It also reduced the kick dramatically and looks great. Every time I go to the range people ask about the break and I tell them about High Tech Customs. I want to thank Rich Reiley for converting a horrible shooting 300 RUM into a tack driver. I read a lot of testimonial's about the muzzle brake Rich makes and at first I was a little skeptical that they could actually be as good as advertised. Well...... they are! Prior to sending my gun to Rich, I was only able to get a 5" grouping at 100 yards. On top of that, the muzzle jump was so bad, you couldn't even find the target after pulling the trigger. Rich bedded and free floated the barrel and installed one of his muzzle brakes. I took it to the range and not only did it "finally" shoot straight, but the recoil and muzzle jump felt like shooting my .270. I am very pleased with the way it looks and the performance. I will be telling all my hunting buddies, were it came from. Thank you very much! I had went to Rich to get some custom upgrades on my Wby Mark V. He put on a Lilja barrel, rechambered it in 340 Wby Mag, flutted the barrel and installed a break. Then I had had him bed the action and tune up the trigger. I worked up some great loads-225 grain Barnes TTSX bullets, Norma brass, Fed 215 Match primers, and 87 grains of RL-22 powder was my final/best load. My gun was now shooting consitantly at or slightly under a half minute angle! Best group was 1/2 inch at 200 yards! 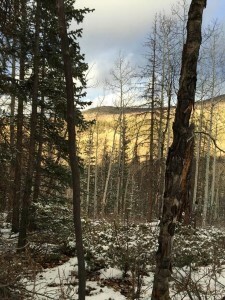 I took this rifle elk hunting this year. After a snowstorm that lasted several hours I went out to glass for elk and spotted a bull bedded in the timber on a ridge 536 yards across a canyon. I shot him in his bed, right through the shoulder, both lungs and the far shoulder, stopping just under the hide on the far side! I couldn't have done it without a gun like this, practicing a lot and working up some great loads! Rich does great work, his guns shoot!! Thanks Richey!! Picture from Elk bed looking towards ridge where shot was taken. Thanks to Rich Reiley for making this custom 340 that took this elk. Long shot but I took it, 400 yds plus, because I knew the gun and how it shot. I used federal ammo factory, loaded with 225gr. Trophy Bonded bullets. Money is no object when you get a bull like this. THANKS RICHEY. We went to HTC to have a muzzle brake done for my wife's Ruger No. 1 in .25-06 and I hve to say WOW! He had told us it will not drop the felt recoil to much but would be easier for her to shoot. We took it out to the range and it has less recoil than her AR in 5.56! It really has no recoil to speak of. Loud as heck but no recoil. My hats off to you and I am getting ready to bring in an FN-FAL, DSA Arms to see if they can tame her next! Thanks to Rich Reiley for making this custom 340 that took this elk. Long shot, but I took it, 400 yds. plus, because I knew the gun and how it shot. I used federal ammo factory, loaded with 225 gr. Trophy Bonded bullets. Money is no object when you get a bull like this. When I found out I drew a tag in Wyoming, I knew I had to get in touch and have the 340 made. The gun when it was finished was only 6-1/2 pounds. I thought, well, this gun is going to kick. Surprise, it did not, your brakes work great. I went with Cheyenne Table Mountain Outfitters, good group. Scott and Angie Denny gave me a real good hunt. The guide Dan Saylards is one of the best I have ever had. I spotted the bull about 7:30 in the morning. He was with about 40 cows and a couple of smaller bulls. They were running away from us, so I knew I had to act quick. At about 400 yards the bull turned just enough to get a shot off. Guess what? That was all it took, the gun did its job. 225 gr. trophy bonded bear claw in Federal ammo did the trick. The Lilja barrel, the brake, the bedding, all the work you put into the gun was great! 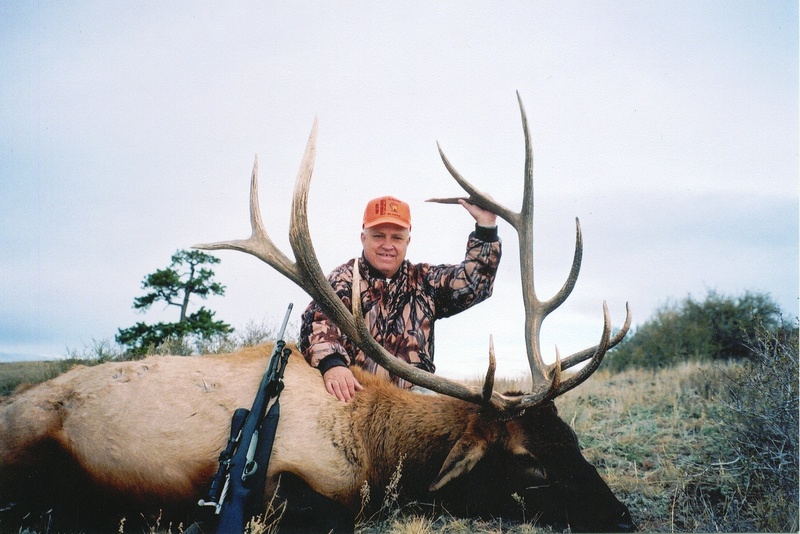 It all came together and this elk, which scored 355, was the reward. Of course, you do have to know how to shoot just a little. Right Rich? Thanks again for a very good product. 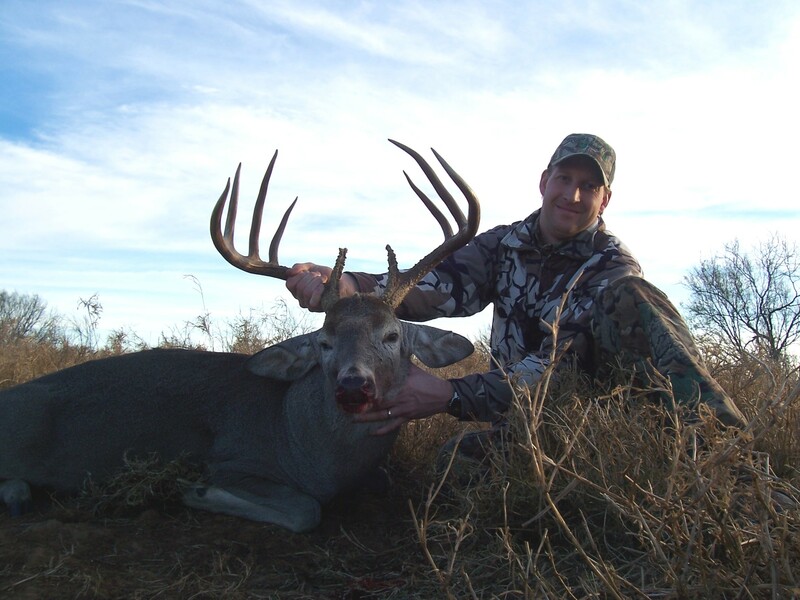 John and I made it to the ranch named Todos Santos in south Texas and we both shot nice whitetails. John shot his on the first day of the hunt and consequently let me use his 270(the one you built him). I then proceeded to shoot a deer and a wild pig with it. You will be happy to know that your rifle killed 3 animals with 3 shots. We flew into Texas and sighted our guns in, and as usual, the 270 you built for John shot a 3 shot group of about .35". Since you are in the process of finishing up my 270, I used an off-the-shelf Remington 300 SAUM. Unfortunately, that poor gun must have gotten bumped during our travels because it was shooting 4" high and 3" to the right. I only had eight rounds with me and I had to use four of them to nurse the point of aim back where I wanted it (important lesson learned; bring more ammo). However, something was still out of whack because it didn't group well. I had no choice but to hunt with the rifle that day, but I must admit I was not very confident about where it was shooting. 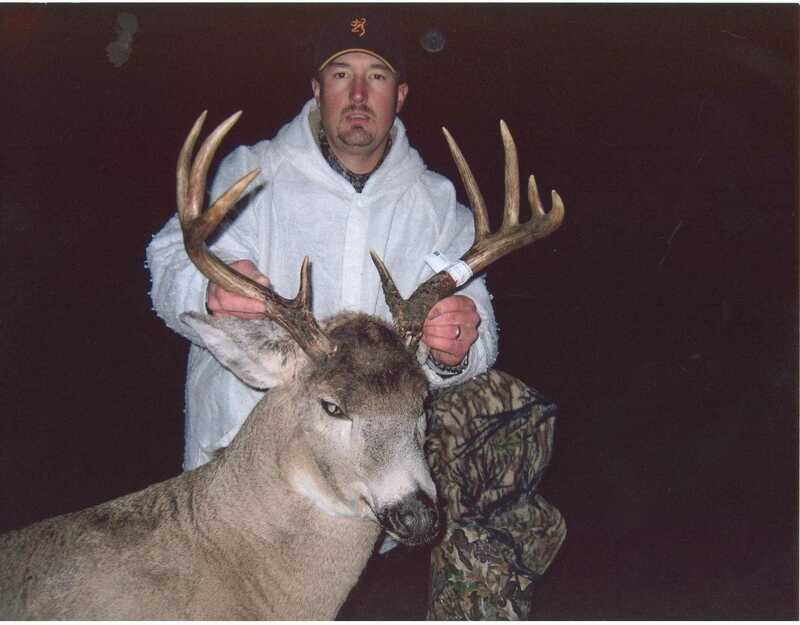 That night, John shot a nice 8 point buck. Since he had already taken his deer, I asked him if I could use the 270 you built him to pursue my deer. He said no problem. At this point, I was feeling very confident because I know that gun is a tack driver and has one of the nicest triggers I have ever used. I went out the next day and proceeded to drill a wild pig and a nice 9 point buck. Both shots landed right behind the shoulder where I was aiming and neither animal traveled more than a few feet. Peace of mind is worth its weight in gold when hunting and it was nice to know that I was using a gun that is as reliable and accurate as they come. I can't wait till you finish my 270!! Keep up the good work. Thanks for building me such a fine 30-06 two years ago. As you can see by the photos it has been a great shooter. Both elk and caribou are one shot kills, the sheep was 2, but the distance was nearly 400 yards. Now I need a mag. built for moose and grizzly. Please work your magic again for me! I just wanted to say thank you for building great rifles. The 358 STA you built is a tack driver and a pleasure to shoot. I took it on a mountain goat/moose/bear hunt in British Columbia in September and it performed flawlessly. The outfitter and guides were asking me before I left where they could get one. I harvested a goat and a bear but did not get a moose. The rifle was light enough to carry on the goat hunt but packed plenty enough power for everything I was hunting for. I passed on 3 small bulls but could not get a shot at the large moose I saw. The goat and black bear were both one shot kills. I plan to use it for elk and deer in the next few weeks and have the confidence that this rifle will perform. Thanks for the great custom built .340 Wby. rifle. The performance of the rifle was flawless in the subzero temps of Meadow Lake, Sakatchewan hunting for whitetail deer. While I only had an 80 yd. shot, the 260 lb. deer was no match for the .340 Wby. The rifle tuned with my custom ammunition with 225 Swift A-Frames (excellent bullet Mr. Hober) shoots consistently 1/2 MOA at 100 yds., you will have to look long and hard to find a better performing bullet in any caliber. The Lightweight Shadow is easy to carry and balances with ease. The fit and finish is Bar-None and is a pleasure to shoot, as with the other High Tech Rifles that I own. Once again, thanks Richey and Paula for all the support I received. I just wanted to drop you a line and tell you how pleased I am with the lightweight (6-1/4 lbs) .340 Weatherby Shadow you built for me in 1998. In the hunts that I have used it on, it has now been fired once each at a total of 10 animals (2 Antelope, 3 Mule Deer, and 5 Elk). Although shot placement certainly has some impact, not one animal has ever taken a step after being hit with factory Weatherby 200 gr. ammunition. A quick clean kill should be the objective of all hunters and I feel that this rifle is as much a part of that as my shot placement. These one-shot kills have ranged from 35 yds. to laser-measured 330 and 427 yds. on Elk, to 275+ on Antelope, and 200+ on Mule Deer. I know you and I were both very surprised at the performance of the factory ammo, but not with the outstanding performance of the rifle. 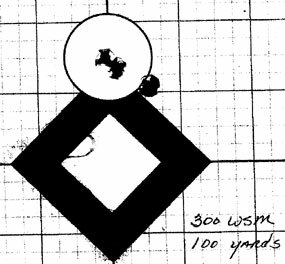 With factory ammunition, it consistently shoots 1/2 MOA groups at 100 yds. and is a sheer pleasure to hunt with. Weighing less than 7-1/4 lbs. all decked out, I can (anyone could) carry it in the Rockies all day/all season without any discomfort and with your custom muzzle brake, it is like shooting a lightly loaded 30-06. My rifle is frequently admired by all for its appearance and my hunting buddies are always amazed at its performance. I am currently planning to have you custom build a .300 Wby. beanfield rifle on a Sako action, and I'm sure it will be just as accurate and reliable as my beloved .340. Thanks for building what has quickly become my favorite rifle (and I have many). I recently returned from my hunt in Zimbabwe for buffalo using the .416 Remington Magnum that you built. 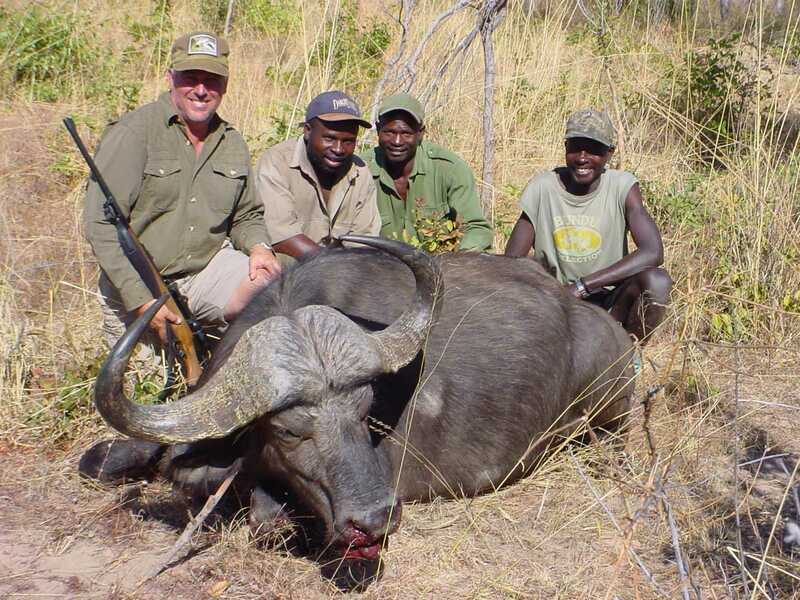 I hunted hard for 8 days before shooting the nice Cape buffalo (42") that is pictured. 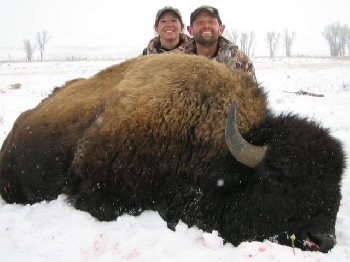 It was my first buffalo, and even at 75 yards, pulling the trigger on something that could put you in a world of hurt if you don't make a good first shot is not something I was taking lightly. Having total confidence in the accuracy of my rifle was an essential prerequisite, and I knew that the .416 would get it done. The proof is in the pudding, or in this case, the large hole straight through the heart of the buff, which pleased my PH so much that he insisted on photographing the evidence. Many thanks for providing me with a rifle that is as beautiful as it is accurate; we are tightly bonded now, and I look forward to carrying it again on my next Africa safari. Just thought you might want to see June's buck she killed this season with her new rifle. I must say it does have a "little" kick to it. She was not too sure she would like it, but I assured her in the heat of the moment, she would not notice it. She did not recall it kicking at all. I still don't know it's real potential, but it was good enough for 2 good hits at 383 yds. and 510 yds. My life long friend and spotter, Steve Kelley, and I took a trip to New Mexico to a ranch we often visit to have a little fun. We shoot off a ridge that allows us to shoot with the wind, almost, across a creek bed, and up a hillside that runs almost a mile. This not-so-smart dog came up just left of the 1000 marker, and I killed him with the 4th shot. We used a Swarovski 1600 rangefinder to range back to the shooting table. The High Tech Customs rifle is built on a Remington 700 action with a 29 1/2 inch heavey Lilja SS barrel with an HTC muzzle brake, chambered for 6.5x284, in an HS Precision target stock with a Jewel trigger. The scope is a Leupold VX-111 LR Target 8.5x25 with a 30mm tube with a varmint hunter reticle mounted with Leupold 20 degree off-set base and rings. I used Black Hills gold ammo. They load 142gr Sierra HPBT in Norma brass at about 2980 feet per second. It was the driest, and the fewest number of prairie dogs there I've ever seen and too windy to shoot long range most of the trip. My name is Jeff Bruggeman and I am 13 years old. I am from Idaho Falls, Idaho. 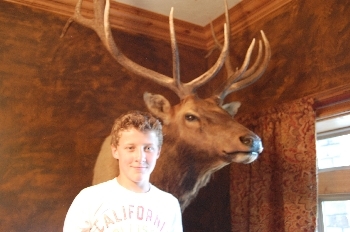 This was my first year to hunt Bull Elk. My dad bought a .340 Weatherby from High Tech Customs and said I could use it. At first I was not sure this gun would do the job because it felt as light as my pellet gun. Then I saw the cartridges and I was a little nervous. My dad said it didn't kick, so I headed up the hill through the snow. When I got to the top of the ridge the elk we'd seen was gone. I let down my guard and my spirits. All of a sudden there he was, right underneath us. I didn't have time to do anything but point and shoot from my shoulder. Down went the elk and dad was right, my 20 gauge shot gun kicked harder. Thanks Richey for making my first elk hunt the best. Hi there..my name is Troy Greenwalt and this is my High Tech Customs story. 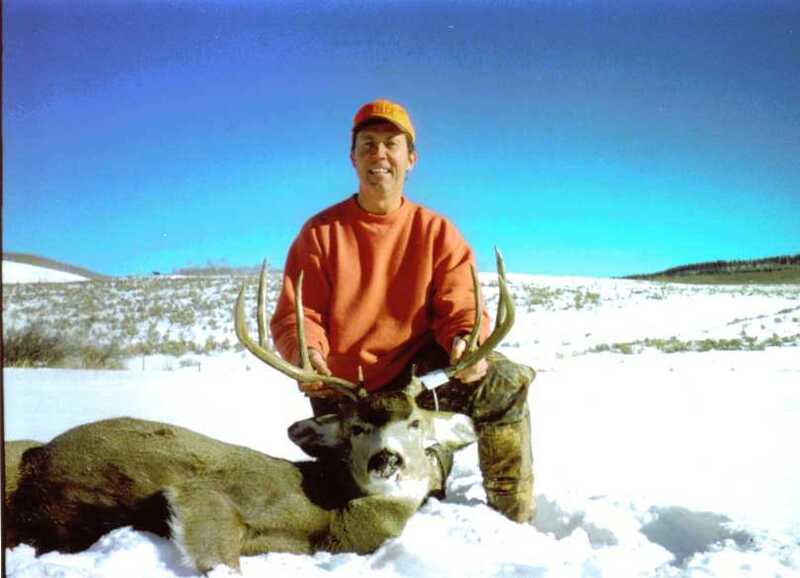 My wife Lorraine and I first met Richie in 1996 at the Denver Sportsman Show. At that time, I was looking to build an elk rifle. Being a southpaw, the selection of factory left-handed rifles was very poor during that timeframe. We were impressed with the muzzle brake that Richie was marketing and with the rifles that he was displaying. After coming home from the show and purchasing one of Richie's donated muzzle brake packages at the RMEF banquet, I was ready to commence with the rifle build. Richie used a left-handed Remington 700 action and built me a .338 Win Mag rifle. We were so impressed with the gun that we next had him build Lorraine a lightweight .257 Roberts on a 700 short action platform. That gun made her a deadly shot out past 400 yards! A few years later, I decided to breathe new life into my trusty old Model 700 .270 Win. The only part used from the original gun was the action and Richie tricked it out as well. The final custom that Richie built for us used a Model 7 action in .300 Rem SAUM. That gun is Lorraine's elk and moose slayer and carries like a feather! All of our customs utilize Lilja barrels and are tack drivers. When it comes to cleanup time, those match grade tubes clean with ease. Richie does more than just build customs. He can do any type of work on your present rifle. We have had him do several bedding and trigger jobs on factory guns that we own. Whenever we go to visit Nancy and him, we usually take along a carload of our friends rifles to be worked on. 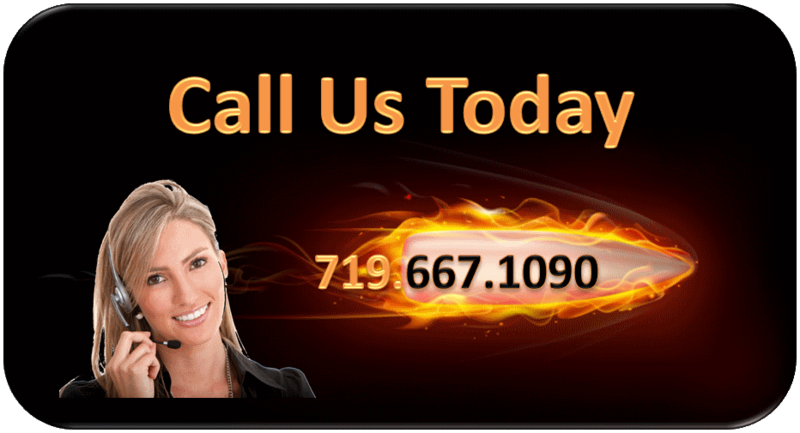 Give Richie a call if you need a new rifle. I am always looking for an excuse to get another custom built! During the last three months I have been on three sheep hunts and the "340" performed as expected on all three hunts. 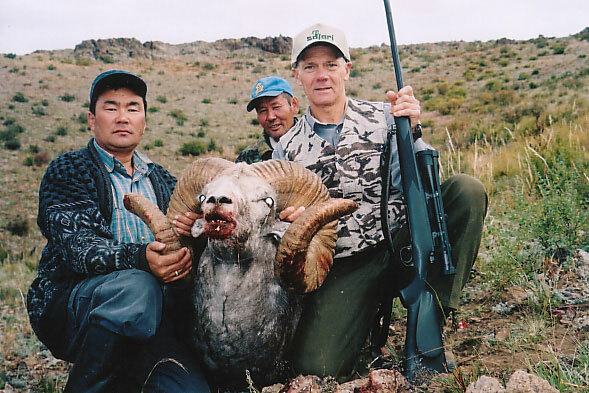 The first hunt was in Mongolia for Hanghay Argali in September/October, and I took the sheep at 400 yards with a one shot kill. 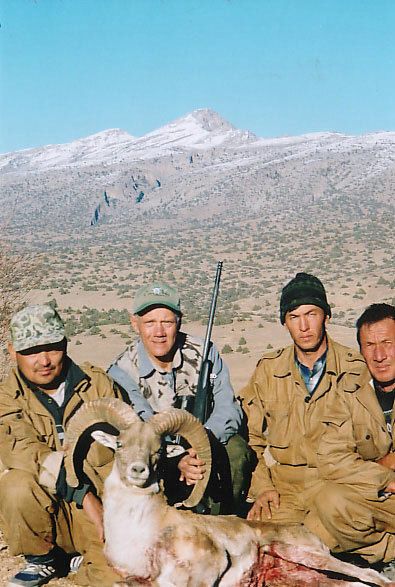 Earlier in the hunt my guide asked me, "what is the longest I had shot a sheep," and I told him with some bravado, "I had taken my Marco Polo last year at 627 yards in Tajikistan at 18,000'," which he did not forget. During the stalk on Argali we got within 400 yards, and guide asked me if I wanted to take a shot, I suggested we try to get 50-100 yards closer by working around mountain, and he said "this is only 400 yards, and you are good shot at over 600 yards." I took the shot. As I mentioned to you earlier, it was a perfect shot through lungs and heart, but 225 Swift-A-Frame entry and exit holes were the same, no expansion. 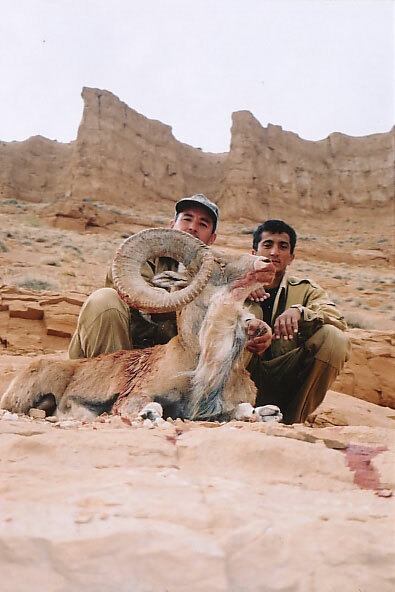 A few days ago, I returned from three week hunt in Turkmenistan during October/November, where I hunted Transcaspian Urial in Southern area next to Iran, and Afghan Urial in eastern area next to Afghanistan. Both hunts were successful, and I took a 12 year old 37" Transcaspian Urial at 250 yards, and Afghan Urial at 150 yards with "Texas Heart Shot," which went all the way through and exited chest area. On the way home on the plane I got to thinking, this rifle and I in a few short years have hunted in over 20 countries for African game and sheep of the world from Canada to Siberia. This last trip was special, I completed my Ovis World Slam of Sheep (12), and all 12 were taken with "340" with one shot each. I have a few more sheep and goat hunts scheduled for next year, and certainly hope you can work up the 210 Siroccos we have talked about. I have been home a few weeks from last sheep hunt, so wanted to get off a quick report on last two sheep hunts and how the 340 wby. "Shadow" performed. I have been trying to complete this hunt the last 2 years, and after 4 attempts, I finally was able to complete this hunt in February earlier this year. After 2 days in Moscow, 4 days of travel and delays through Bishkek and Osh, and after 10-hour drive and 10 checkpoints through Pamir mountains, I was finally in Yuri Matson's camp on Karakul Lake in Tajikistan. 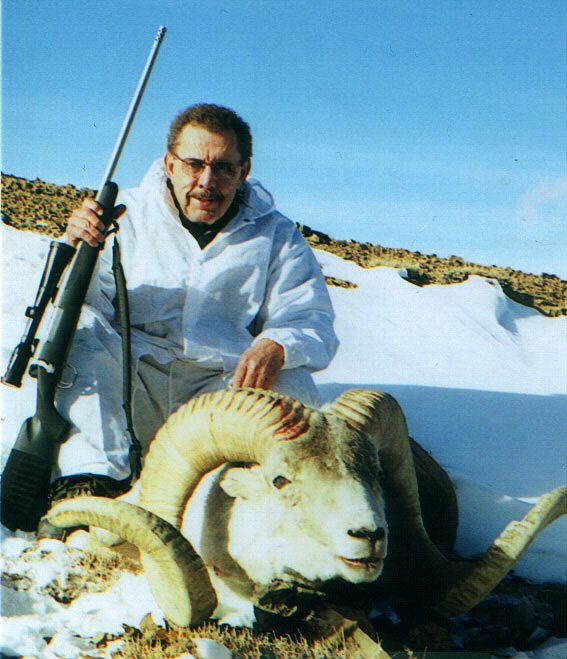 During the first few days of the hunt I saw numerous rams, may in the 50-55" class, but elected to pass. I had no problem with altitude, so wanted to hold out for an exceptional Marco Polo trophy, even if it took 12 days. After glassing and completing several stalks, it became obvious that when I found the "right" Marco Polo, any shot attempted would be at long range. Later in the hunt we completed a stalk on 6 rams, and I realized the one ram was exceptional, 57-60", and was what I had been looking for. We got within 350 yards and they spooked and started to run. I squeezed off a shot at estimated range of 450 yards and hit him, but he did not go down. The ram was hit hard, but managed to move up a drainage and finally materialized, stopped, and turned broadside. I estimated range at 600 yards and squeezed off another 225 Swift-A-Frame, this time he went down for good. The altitude was 18,125' and the distance of the final shot was 627 yards! Siberian Snow SheepA few days later I also shot an Asian Ibex, which was at a distance of 425 yards. Back in March, I sent you a photo of Marco Polo with rifle, but I have enclosed another photo of Marco Polo trophy in the field. By the way, the Marco Polo was exceptional, over 59" with 16" + bases, it scored 224 ¼. 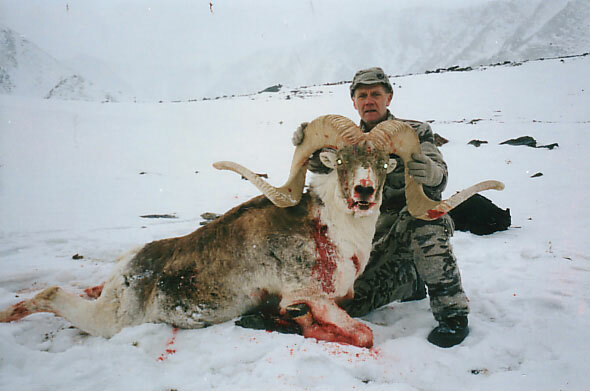 In October of this year, I completed a hunt in Siberia for snow sheep. I took 2 sheep on this hunt, both out of the same herd. As usual my 340 wby. "Shadow" provided plenty of reliability, under some very demanding weather conditions: rain, snow and extrememly cold temperatures. 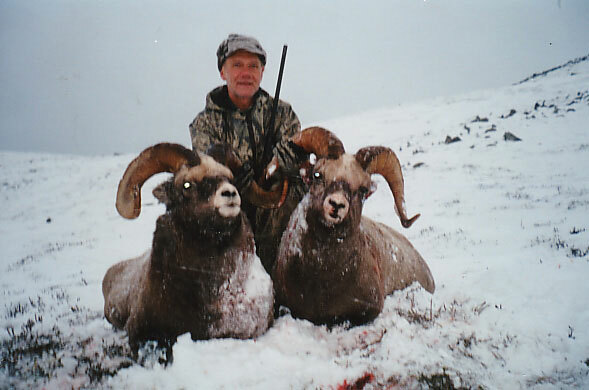 Both sheep were taken with one shot kills, but for a change, this hunt did not provide any real long range challenges for "Shadow," both sheep were shot at less than 250 yards. Also enclosed pictures of Snow Sheep. I plan on again putting "Shadow" to the test next 12 months; Iranian Red and Armenian Sheep in January, Blue Sheep in China in March, Ibex in Spain in May, Kamchatka Big Horn in August, and Hangay Argali in Mongolia in October. I will send additional reports and pictures in future. I just returned from second sheep hunt in 2 months, and can report another successful hunt with my custom 340wby, "Shadow". 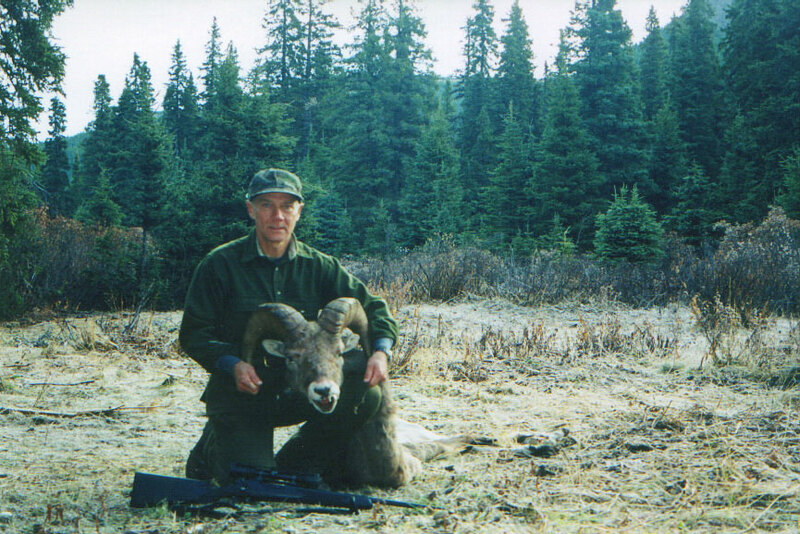 My hunt was with George Kelly in Willmore wilderness area of northern Alberta Canada, and I will try to give you a few other comments on this hunt. It was a long hunt and we covered a lot of area on horse moving spike camp 5 times, and climbed a lot of mountains looking for a legal ram. It was the climbing of the mountains that once again made me appreciate the lightweight of the "Shadow". On the 13 Th. day of hunt, and a 30 minute walk to look at some tracks (I decided to leave back pack, which contained camera, behind because of short climb), which turned into a 5 hour climb and 1 hour stalk, we spotted 9 rams at the top of mountain in a shear ledge of rock. The 9 rams were secure in the rocks above some 800yards away. After some time George suggested I fire a round 200 yards on the other side of rams, which I did. The rams exploded from rocks toward us and angled toward the top, and at 385 yards I hit the first ram with a 225 a-frame, and the ram went down like a rock, slid over the edge, fell 200+' and hit the bottom, and proceeded to bounced about a half mile down the steep mountain side. Because the camera was back in my pack, I could not take a picture showing the big horn and the massive mountain he fell from/down. The enclosed picture was taken the next day back in spike camp. The horns were not massive, but the ram was an old guy, 10.5 years, and because of bad teeth did not have many months left in the wild. As a side note, the other 2 hunters were shooting 7mm and a 30-06, and they both wounded and lost rams. Also, when we got back to base camp, the other 2 guides who seemed to doubt merits of 340 as sheep gun, both asked if they could "shoot a few rounds". 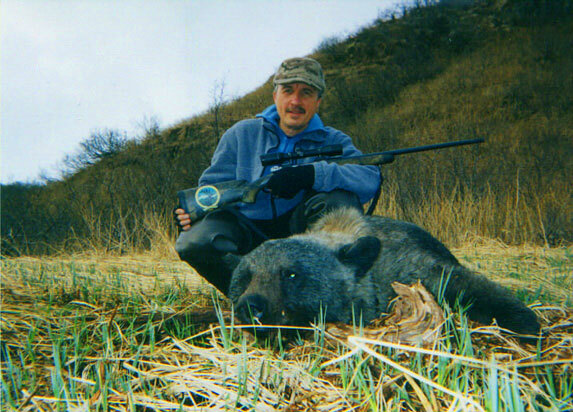 I am scheduled to leave in a few days for third sheep hunt this year, Marco polo in Tajikistan, and the 340 "Shadow" will be the gun of choice for this hunt to. Perhaps I will have pictures for you at S.C.I..
Based on the fact you were the third call (family No. 1, office No. 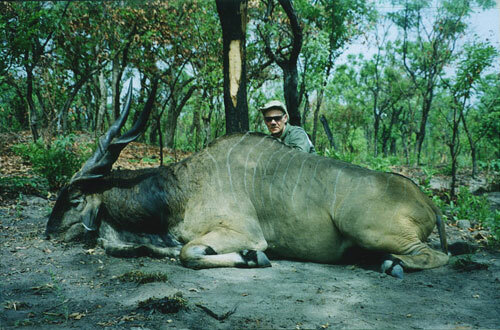 2) I made when my flight arrived in the U.S.A. from Central African Republic, you received an early report on the success of my hunt for Giant Lord Derby Eland and performance of my new "Shadow" 340 Wby. Now that I have had a couple of days to get settled back into my domestic life style and business routine, as promised, I will provide you with more details on the hunt. I really appreciated the effort you put forth to get my new "Shadow" to me before my hunt. Although I lacked total confidence in how it would perform because I only was able to fire 15 rounds at the range the day before I left, I did have a certain level of confidence based on your comments and the solid grouping of shots I had with the 15 rounds. My confidence was somewhat shaken upon arrival when my P.H. advised me of heavy trees and brush we would be hunting in, extreme temperatures (100-120 degrees), and his preference for clients to shoot a 375 or higher caliber rifle. Even after an impressive three shot grouping at the practice range, my P.H. reminded me that, "punch was more important than speed". The uncertainty associated with my "Shadow" was put to rest after eight days of tracking and stalking the "Ghost of Africa" when I finally got into a position to take a shot at an exceptional Giant Lord Derby Eland. The bull eland was 220 yards away facing me at a 3/4 angle in heavy brush. To make it even more of a challenge, a tree shielded shoulder area and heavy brush shielded all but the lower left front shoulder area. Based on position of eland, my angle, and the brush, I had a window of approximately 6"x8" that if the shot was perfect would hit the lower front shoulder area at an angle and penetrate the vital heart area. I squeezed the trigger, heard the 250 grain swift A frame hit something solid (tree or eland? ), and was sure I saw the bull "arch" before running. As we learned later, it was a perfect heart shot, yet the bull eland managed to run 75 yards before collapsing. The P.H. said it was the most difficult shot he had ever let a client take on an eland, so he either had confidence in my "Shadow" or shooter, or both. I went to the CAR to take a respectable Giant Lord Derby Eland, and as the enclosed photos document, I was successful in taking an exceptional trophy, it was a mature bull measuring 52 3/4" L and 50 3/4" R, with heavy ridges and basis. 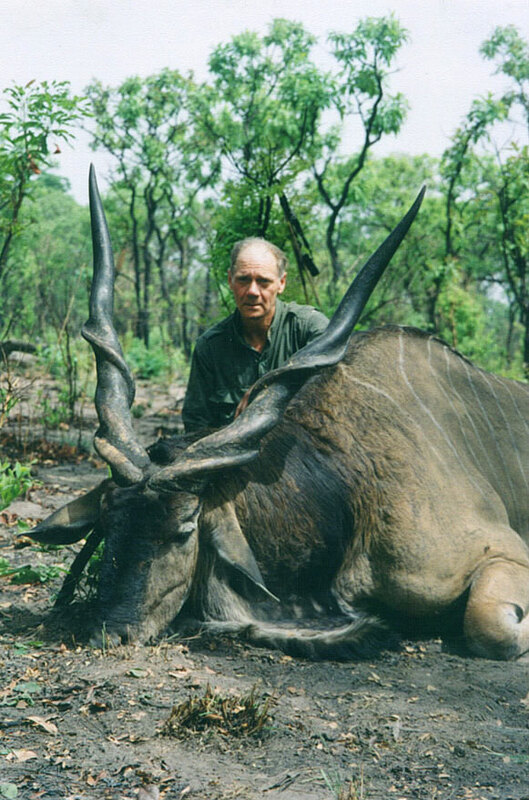 I was really only interested in hunting for Giant Lord Derby Eland in CAR, but I also took a bushbuck and hartebeest in the final days; three shots three trophies. The rifle delivered everything in the field I had expected and you had promised. As an added endorsement after carrying a rifle for eight days in 100 degrees plus temperatures, I really came to appreciate the feel and weight of the "Shadow". During the next five months I plan on spending more time at the range shooting at 300 yards plus, getting ready for my dall sheep and stone sheep hunts later this year. After my hunt in Africa for Giant Lord Derby Eland, I have decided to take my new "Shadow" 340 Wby on the sheep hunts and leave my 300 Wby at home. In summary, I really like the performance of my new custom gun, thanks for delivering the quality, accuracy, and performance you originally committed. During the next few weeks give me a call to discuss my possible interest in a 450. 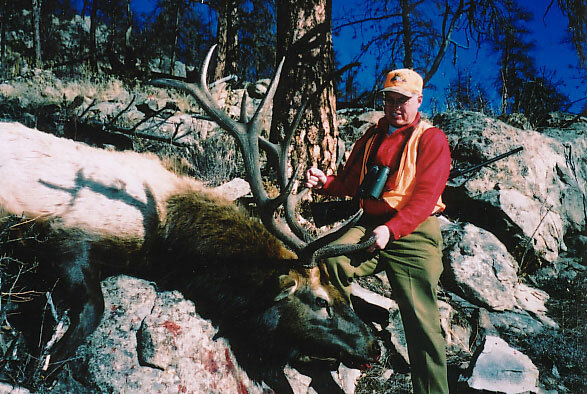 With a HTC Hunting Rifle In 2002, I took four trophies with my HTC Model 70 in 300 Winchester Magnum. The rifle is quite friendly, not a featherweight but portable and quite manageable without a muzzle brake. At the range I found it to be very accurate with either Swift A Frame or Scirocco bullets in 180 grains. The rifle shoots very small groups at 100 yards and is a consistent sub MOA performer at 300 yards. In the Yukon, I found all the shooting to be rather long, taking a Stone ram at 365 yards as the farthest shot and a wolf at 225 yards as the closest. 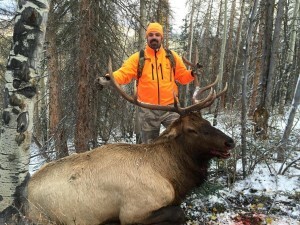 On a late season Colorado elk hunt, it proved to have plenty of performance to take a nice 6-point elk. This is the kind of rifle a serious hunter needs, setup with top optics, it is portable, user friendly and very accurate. Plenty of reason to have confidence in this one! 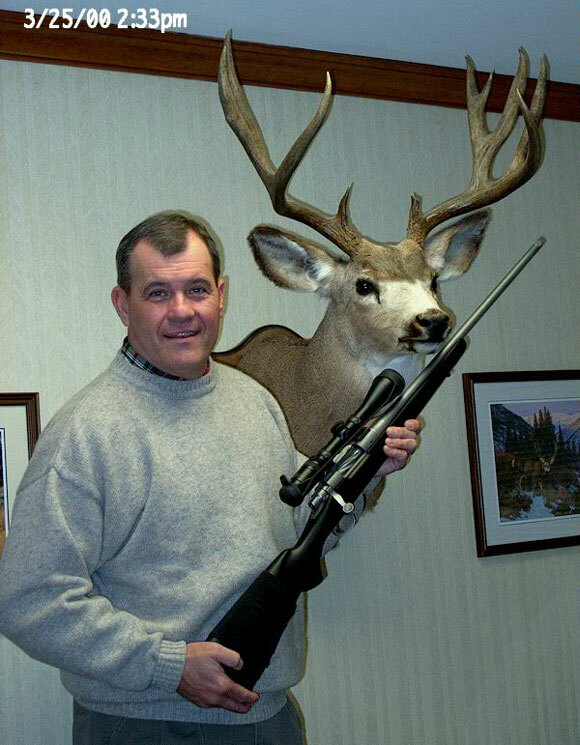 I thought you would like to see the deer I shot with the rifle you built for me. It's a delight to carry the 300 WSM and really does its job. It is also very accurate as you can see from the enclosed target. Thanks for doing such a good job! I am enclosing a picture of my Marco Polo Sheep that I took in Tajikistan, Russia on November 22, 1999. It was taken with the fantastic 340-caliber rifle you made for me. The rifle is also shown in the picture. The right horn is 57 inches and the left horn is 58 inches with 16-inch bases. 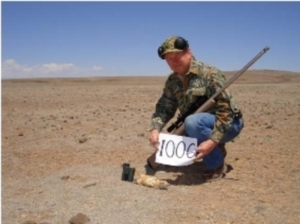 I suppose the rifle performed satisfactory in view of the fact that is was a one-(1) shot kill at 800 plus yards. Yes, I said 800 plus yards. Naturally there had to be some luck at this distance. I was approximately 1/3 way up one mountain with a valley between the mountain I was on the next mountains. I spotted the ram and 6 ewes approximately 2/3 the way up the mountain on the other side of the valley. I have a Bushnell 800 Range Finder but was unable to get a reading on the ram. I came approximately 1/4 way down the mountain the ram was on and could get reliable readings at 780 yards and 790 yards on different colored rock formations, however where the ram was located on the mountain was over 800 yards and the Range Finder would not give me a distant readings on the ram or any different colored rock formations. I was in a prone shooting position with the rifle resting on my coat. The ram was at a 45% degree angle, therefore I elevated the cross hairs at what I believed to be about 3' feet above the rams front shoulders or about the body thickness of the ram. I squeezed a round off and hoped I had estimated correctly. According to my guide, the ram slumped forward and almost went down after the shot, however the ram and ewes ran over the top of the mountain. We then started a stalk up the mountain where I had shot at the ram. We found a good blood trail of which did not appear to be a flesh wound. After we topped the mountain we saw the ram standing on the mountain peak of which was several 100' feet vertically straight down. My guide and I decided not to shoot the ram again, as there was a danger it would fall down the vertical side of the mountain and break a horn. We decided to go back to camp and get extra help and a tracking dog and return in a few hours. This we did and when we returned we found the ram dead approximately 200 yards from where we had last seen him standing on the mountain. That's my sheep story with the great 340-caliber rifle you made for me. 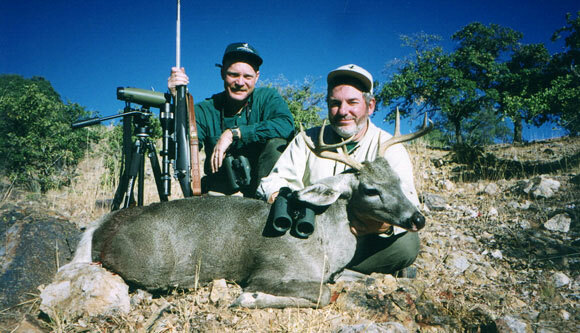 Just wanted to send you a couple of quick pictures of a coues deer hunt I did in Mexico with Craig Boddington in which your 7mm Weatherby Magnum rifle worked perfectly on a very wide coues deer buck. The .375 H&H did its job in Alaska. Without your muzzle brake, I wouldn't have had the confidence to shoot from such an awkward crouch at a 200+ yard target. My left hand was holding down an alder branch to create an open shooting lane. The forearm of the rifle was laying across my knuckles. My knees were bent and I was stock-crawling towards the scope. Needless to say, I was most relieved to have made the shot - and escaped undamaged! A trophy Glacier Bear!!!!! I'm very pleased to learn that the Shadow shoots the 250 grain A-Frames so well. I hope the 225's do as well. I can play with the 217's until they do their job. I'm certain that the teflon-coated Shadow, with its detachable scope mounts and back-up Swarovski scope, will be "my rifle of choice" for most hunts. Let me know when you're ready to ship. I'll need to send you some money!